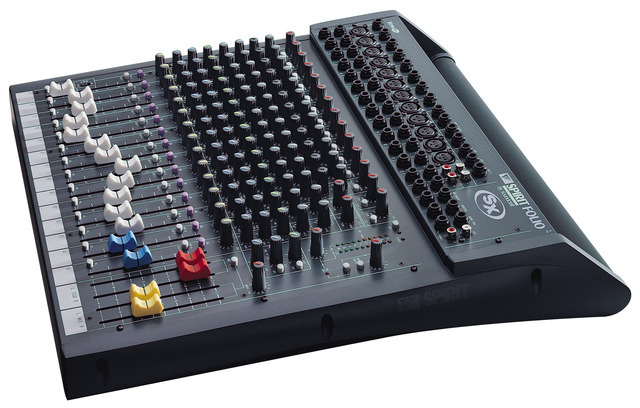 Spirit SX is a flexible 4-bus mixer capable of producing Digital sound quality for both live and recording applications. It includes 20 inputs as standard and 18 outputs (including Auxs and Direct Outs). In addition to mix outs, two sub-buses allow groups of instruments to be sent to multitrack, to additional speakers, or sub-grouped to mix. There are also four stereo inputs for keyboards or other stereo instruments. SX's 8 Direct Outs are fader pre/post switchable so they are equally useful for recording in the studio or at a gig. 12 mic/line inputs are equipped with Soundcraft's UltraMic™ preamp giving a full 60dB or gain range and +22dBu of headroom, meaning that the SX input stage can handle any mic or line device. In the EQ section, the classic British 3-band EQ with swept mid benefits for custom designed pots which give greater control across carefully chosen frequencies. There are 2 auxiliary sends, 2 of which can be assigned pre- or post-fader making them equally useful for monitor-heavy live mixes or effects-heavy recording. In addition, there is a separate Mono Output and 2 subgroup outputs. 100mm faders are used through giving more accurate control at mixdown and all pots have been custom designed to give even and consistent response around the entire sweep. The SX fits all of these features into a rugged, compact frame with integral carry handle which can be optionally rack-mounted in to a 10U space.